Over the past 18 months, Middletown City School District has identified addressing overcrowding and space concerns in the elementary buildings as a priority. In 2018, the district evaluated a variety of options for adding new academic space. In October 2018, the Middletown Board of Education determined adding space to an existing building was the most fiscally responsible decision. As with any project involving construction, the construction timeline dictates delivery. During the upcoming community conversations, district leaders will discuss the options for the $10 million elementary expansion project. As a district, we will hold voluntary staff meetings and community conversations with every elementary school. We will gather the input of each elementary school and we will report our findings at the next two BOE meetings (February 25 and March 18). A proposal will be shared with the Board of Education (BOE) at the April 8, 2019 BOE Meeting (6:30 PM) with a board vote scheduled for April 29, 2019 (6:30 PM). Pending BOE approval, the construction timeline will begin after the vote. Over the past 18 months, Middletown City School District has identified addressing enrollment and space concerns in our elementary buildings as a priority. Creekview Elementary, Rosa Parks Elementary, and Wildwood Elementary are experiencing the highest degree of enrollment and space concerns. At the September 24, 2018 Board of Education (BOE) meeting, discussion focused on building capacity and new, innovative academic programming at the Middletown City School District’s elementary schools. At the October 8, 2018 BOE meeting, the board passed a resolution to solve the space and overcrowding problem (read more here). How will the district fund the project? Financing for this project comes from the $10,000,000 savings we incurred from the State of Ohio on our Middletown High School renovation and new Middletown Middle School construction projects. At the October 8, 2018 BOE meeting the board passed a resolution to sell the remaining bond funds to add additional academic space. As with any any project involving construction, the construction timeline dictates delivery. Project decisions are being made now to ensure the new academic space will be ready August 2021. The $10 million project does not require a bond levy (read more here). “In May 2014, the Middletown voters passed a bond issue for $55 million. Through our partnership with the State of Ohio, we only needed to utilize $45 million for the new Middle School and modernized High School. This means we have $10 million we can use on permanent improvement projects such as adding to an existing building. The cost of the project including architect fees, construction management, and the actual construction is limited to the $10 million.” -Randy Bertram, Treasurer at MCSD. The district evaluated a variety of options for adding new academic space. In the fall of 2018, the district determined adding space to an existing building was the most fiscally responsible decision. Two options are being explored by the district, neither to exceed $10 million: 1.) Add 28,000 square feet on to one existing building, or 2.) Add classrooms onto multiple buildings. How can I learn more about the project? Between February 20 and March 14, 2019, district officials and the Board of Education (BOE) are meeting with the community and staff from every elementary school to discuss the project. The district will share the meeting input at the February 25 and March 18 BOE meetings. 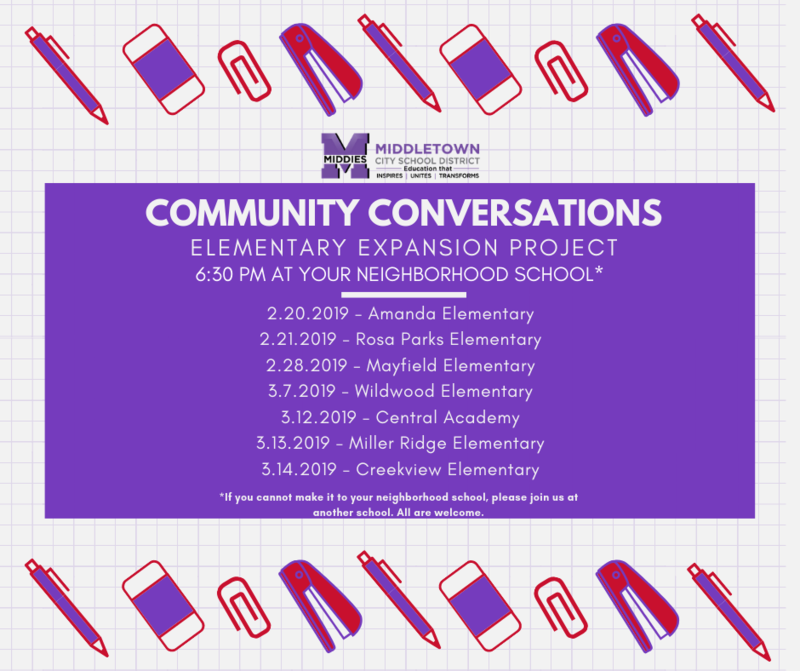 The 6:30 PM community meetings are: Feb. 20 at Amanda Elementary; Feb. 21 at Rosa Parks Elementary; Feb. 28 at Mayfield Elementary; March 7 at Wildwood Elementary; March 12 at Central Academy; March 13 at Miller Ridge Elementary and March 14 at Creekview Elementary. The goal is to deliver additional academic space to relieve our elementary schools. The district will need to add enough space to accommodate 300-325 students to resolve the enrollment and space concerns. Once the location is determined (either Option 1 or Option 2), the district will then determine how students will be enrolled given implementation is set for August 2021. When will the project start and end? It depends on what option we select. If we build an addition onto one building, the additional space could tentatively be ready for the 2021-2022 school year. If we build 2-4 classrooms on viable elementary schools, we *could* have some ready for 2020-2021. A proposal will be shared with the Board of Education (BOE) at the April 8, 2019 BOE Meeting (6:30 PM) with a board vote scheduled for April 29, 2019 (6:30 PM). Pending BOE approval, the construction timeline will begin after the vote. Tell me about the new programming. The innovative programming presented to the BOE on January 14 and 28 will move forward into the planning phase. The Curriculum Department will develop a plan for professional learning to occur around Challenge Based Learning (CBL), K-5 coding, Mastery Based Grading, and Genius Hour beginning this summer and continuing through the next school year. Eventually, the Curriculum Department will scale out the programming to implement in all elementaries. We designed the new innovative academic space to support the functional, academic needs of the new program. What is Challenge Based Learning (CBL)? Challenge Based Learning (CBL) is a learning framework that gives students the chance to solve real-world challenges. The framework fuels collaboration between students, teachers, families, and community members to identify big ideas, ask thoughtful questions, and identify, investigate and solve challenges. This approach helps students gain deep subject area knowledge and develop the skills necessary to thrive in an ever-changing world. To learn more about CBL, please visit https://cbl.digitalpromise.org/. Genius hour is a movement that allows students to explore their own passions and encourages creativity in the classroom. It provides students a choice in what they learn during a set period of time during school. To learn more about Genius hour, please visit http://geniushour.com/.